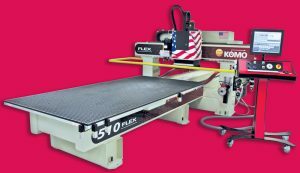 The Flex Series of CNC routers from Komo is available in moving single table, twin table or moving gantry configurations, and all feature a side-mounted tool changer. Features include a four-pole, 18 hp, 24,000 rpm, HSK 63F, fan-cooled spindle, with a 12-position automatic tool changer with aggregate capability. Units have an air blast for optimal dust/chip evacuation and cooling of the cutting tool, and a Fanuc HVI servo system tuned for optimum acceleration and deceleration. The routers have a tool touch-off device with automatic tool data uploading, Fanuc Panel i control with integrated PC, universal grid fixture table available in composite (standard) or aluminum (option), pressurized automatic centralized lubrication system, Komo Production Manager and Machine Monitoring software and a 19 in. colour monitor.